So excited to show you this week’s Sunday video — made by yours truly! 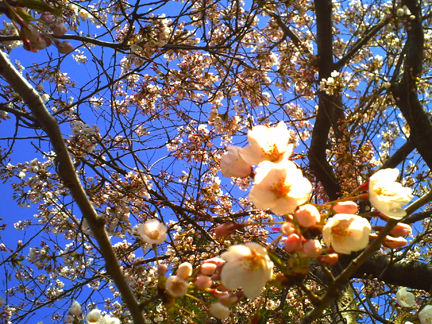 :D Featuring cherry blossoms at High Park, taken with the Zumi. I’ve made videos before, but this is the first time I make a montage kind of video. I didn’t start out wanting to make a montage, but I’m not very good at taking videos, and so out of the numerous clips I took (I lost count) only bits and pieces are usable. So I figure I’d just piece them together and hope it works. Editing the video was a nauseating experience. I don’t have a very steady hand, and I suppose the Zumi isn’t the best camera for taking videos (it’s not shock‐proof at all), and I moved around too much too quickly in an attempt to take in as much of the blossoms as possible… So all the flowers and branches and pieces of the sky were all spinning and swirling together on my screen… @_@ Anyway, I cut out all of the intensely swirly bits, and added other relatively still clips that I also took at the park, of the weeping willows, the duck, and the geese for some visual breaks, so hopefully when you view it it would be more enjoyable. More pictures of cherry blossoms to follow! Here’s one I really like, also taken by the Zumi. That’s the CD I got Mike for Christmas! Glad he is still getting some legs out of it. The video looks lovely Trish — I think Beth and I are going to now go for a walk in High Park today because of it! Enjoyed the video and the music was just right with it! Glad you had a fun day at the park. Oh, and thanks again for the plarn pattern for the fishies. They come out so light, airy, and delightful! thank you, Nancy! i’m happy that the plarn fish pattern worked out for you! take care!